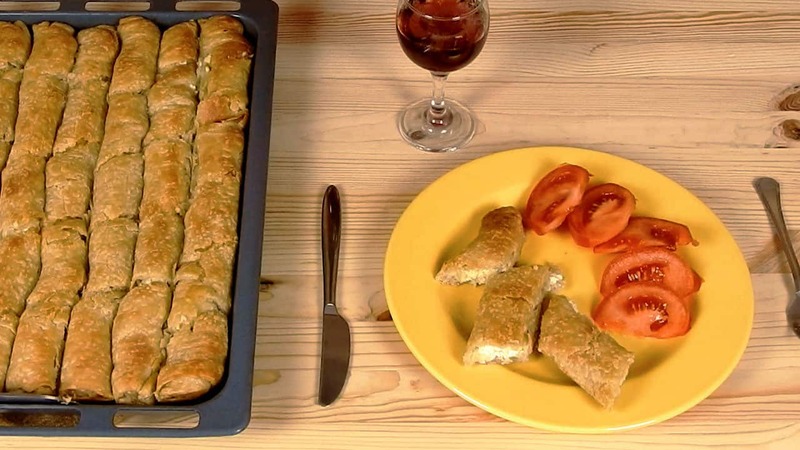 Savoury pies with leek as the basic ingredient, are very popular in Greece. These leek pie rolls are my favourite and they are so yummy! You can eat them, hot from the oven or after they’ve cooled down, or even cold from the fridge. They’re delicious, they’re healthy and you can eat them at any time of the day. For the filling: Heat 60 ml of olive oil in a pan. Add the chopped leek and saute’ for 6 to 7 min. Season with pepper. Place it aside and let it cool. In a bowl, mix the crumbled feta with the grated graviera and the egg. Add the lightly cooked leek and stir. Making the pie rolls: Take one piece of dough out of the fridge and put it on a well-floured surface. Tip: take the pieces of dough out of the fridge, one at a time. Otherwise, they’ll become soft and sticky and therefore, very difficult to roll out. Sprinkle with flour and roll out the dough; give a rectangle shape, 40x30cm/16x12inches.Take a spoon and put filling along the two edges of the sheet’s smaller side. Wrap the filling with the pastry sheet and roll towards the middle. Do the same for the other side. Carefully transfer on a greased baking sheet 40×30 cm / 16×12 inches. Repeat the same process for the rest 3 pieces of dough. Brush the rolls with melted margarine. Bake in a preheated oven at 180°C / 350°F, lowest position, for about 40 to 45 minutes, until they’re golden brown. If you want the pie rolls to stay crunchy, don’t cover them until they’ve cooled down completely. Enjoy, with a glass of red wine!